Come visit the magical Kitsap Forest Theater and Rhododendron Preserve to view an awe-inspiring salmon run. Celebrate the return of the salmon to Kitsap County on Saturday, November 14 from 10am-2pm. Join us at this free event to watch migrating salmon and learn from fish biologists on Chico Creek at the Mountaineers Kitsap Forest Theater and Mountaineers Foundation Rhododendron Preserve. Each year The Mountaineers partners with The Mountaineers Foundation and several other organizations to share the wonder of the salmon run with our community. Activities are for all ages and include informational booths, refreshments, and viewing salmon in the stream. Biologists will talk about the various types of salmon in Kitsap, the salmon life cycle and healthy fish habitat. Dress for the weather and wear sturdy shoes. A visit to the Mountaineers Foundation Rhododendron Preserve involves a hike down to the stream through old growth forest with the last walking tour starting at 1 pm. For further information and directions to the viewing sites, visit www.kitsapsalmontours.org or call WSU Kitsap Extension at 360-337-7224. Want to learn more? Read an article by a salmon-lover who attended last year. 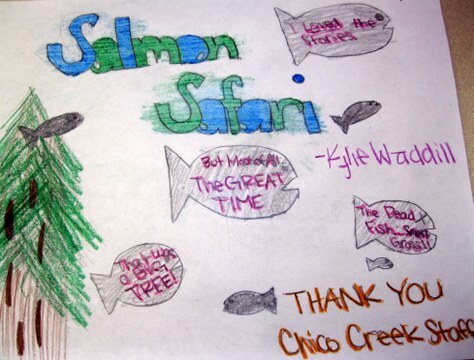 Salmon Tours is sponsored by Clean Water Kitsap, WSU Kitsap Extension, WA Sea Grant, Great Peninsula Conservancy, Kitsap PUD, Mountaineers Foundation, The Mountaineers, Chico Salmon Park Stewardship Group, and the Suquamish Tribe.